7-S framework invented by Tom Peters is a simple yet powerful checklist in the toolkit of a top manager. Learn what it is and how to take advantage of its power by using initiatives and measures. At BSC Designer, we discussed some popular business frameworks like Balanced Scorecard or OKR. The toolbox of a top manager never consists of just one business tool. One should choose the tool according to the business environment, resources, and goals. 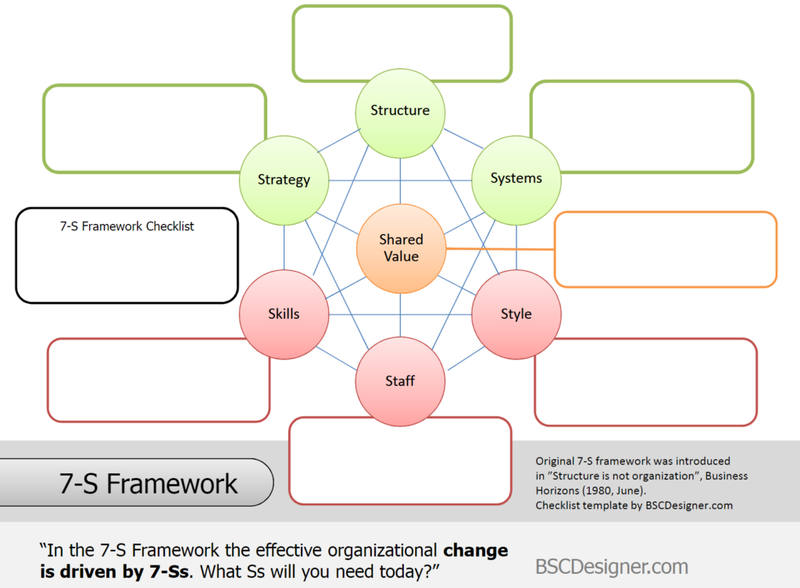 Today, I’d like to talk about the time-tested McKinsey’s 7-S framework. 7-S Template online - sign-up with a free account for immediate access to 16 scorecard templates. The 7-S framework was introduced in 1980; later in 1982, the model was shown to the general public in the bestseller “In Search of Excellence” by Tom Peters and Robert Waterman. Although both concepts address the same challenge of effective strategy execution, I find that each of the frameworks has its unique value for a company. I believe that the BSC is not only fully consistent with the 7-S framework, but that it can also enhance it in use. One of the authors of the 7-S framework, a well-known business guru Tom Peters, shares the history of the business concept in his “Brief History of the 7-S (“McKinsey 7-S”) Model” . The concept was introduced in 1980 in the article “Structure Is Not Organization”  published in Business Horizons. The article addressed organizational effectiveness issues. Co-authors of Tom Peters were Julien R. Phillips and Robert H. Waterman (all worked at that time in the San Francisco office of McKinsey & Company). The picture of the thing is not the thing… An organizational structure is not an organization. Companies failed to execute their strategy and the research done by Tom Peters, and later by his colleagues was about finding other drivers of success and alternatives to structural design. During the brainstorming of the final design of the framework, the authors of the article decided to use alliteration. All of the 7 parts of the framework should have started with an “S”. Probably because of this smart move, the concept is still a must-have part of a business management toolkit. Hard is soft. Soft is hard. “Hard” (strategy or business system), doesn’t generate a result without “soft” (people and our values). In the Balanced Scorecard, there is a similar idea of the shift from the focus on financial objectives. The important part of the 7-S framework is a diagram which has a spider-web form and consists of 7 S-cycles and interconnections between them. This structure was chosen to underline the complexity of factors that can influence the change in the company. The approach of a 7-S framework is multi-dimensional. The elements on the 7-S chart are interconnected with lines of equal size; all of the elements are equally important and all of them should be used together. To make progress in one of “Ss,” you one need to achieve success in the others. It is not obvious which of the Ss will be a driving factor for solving a particular business problem. What Does Each “S” in 7-S Mean? Now, let’s review the Ss from the 7-S model one by one. The alliteration used in the name of the framework helps in memorizing the elements of the framework, but their meaning needs to be explained. When I hear “business structure,” I always have a picture of the organizational chart. The goal of the organization structure is to divide the tasks and resources to make everything work properly. What structure do we need to execute this strategy? Strategy is another hard “S” in the 7-S framework. That’s a company’s route to success. The strategy answers the question of what the company should do to achieve success by taking into account competitors and limited resources. What should we do to solve the specified business problem? How is the customer treated? How does the marketing work? How does the delivery operate? All this is supported by systems. What business system do we need to use or invent to execute the strategy? Without further explanation, it is easy to make a false conclusion about the “Style” part of the 7-S framework. Following the explanations in the original article, I would define the “style” of 7-S as a leadership style and the company’s culture. In simple words: how do executives spend their time? What leadership style and cultural qualities will help us to achieve a strategic objective? With this “S,” the authors of the concept refer to the company’s people. There is an interesting point of view about why managers tend to ignore this aspect of the business. On the one hand, there are formal training programs, appraisal systems that are a prerogative of HR. On the other hand, there is a engagement and motivation aspect that is skipped because it’s not clear how to control them. The result is that managers don’t have any specific plan to improve the capabilities of their team. How should we help members of our team in their growth? 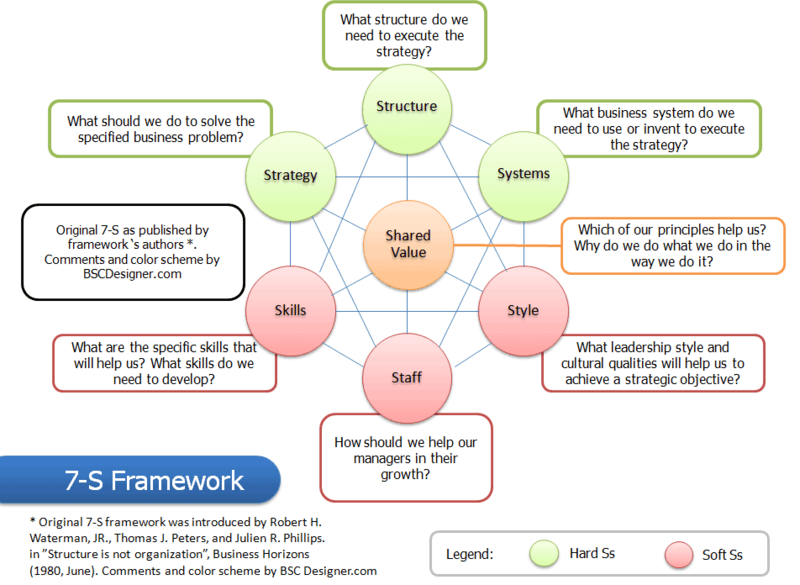 With skills, the 7-S framework refers to the “dominating attributes or capabilities” of the company. There are several interesting aspects highlighted in the original article. First, if the skill/capability is not explicitly marked, then it tends to get lost during a strategy or structure shift. Second, the new skill can appear only when the old skill is revised and removed/modified together with its supporting structure and systems. For these two reasons, it is recommended to work with a company’s skills or at least to label them properly. What are the specific skills that will help us? What skills do we need to develop? In the original, article another “S”-phrase was used: Superordinate Goals. These are the company’s principles/DNA expressed at high levels of abstraction. This is usually senseless for outsiders, but it means a lot for employees. Which of our principles help us? Why do we do what we do in the way we do it? Good news. We can use these 7-Ss just as a simple checklist. No rocket science, no automation software. It gives us a deeper bag in which to collect our experiences. Most of us have black spots… this simple checklist causes you to step back and think about elements that are natural to you. Officially, an action plan and KPIs do not form a part of the 7-S framework. But it is obvious that no strategy can be executed without suggesting and working on some action-oriented initiatives. Business challenge: Get more qualified visitors to a website! Before, I’ve mentioned that in the case of using a 7-S framework as a simple checklist, there is no need for automation software. 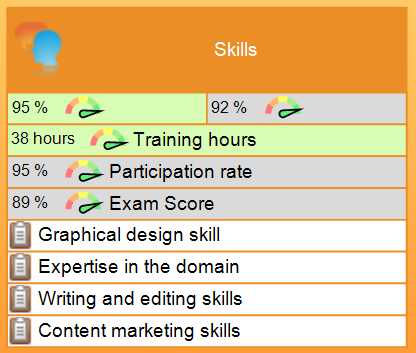 In this example, I plan to connect some of the “S” to the performance metrics and align them with action plans (initiatives) – in this case, BSC Designer will be very helpful. I’d start with “Systems.“ Getting more qualified visitors is about attracting traffic from search engines. Attracting traffic from search engines is about creating high-quality content. We need a Content Business System for this. I’ll map it to the “Systems” in the form of an initiative (see the screenshot on the right). We also need a Marketing Business System. The goal of this business system is to promote content in social media and by other means. As for the measures for this “S,” we can connect our marketing system to the marketing scorecard that will deliver the necessary KPIs. 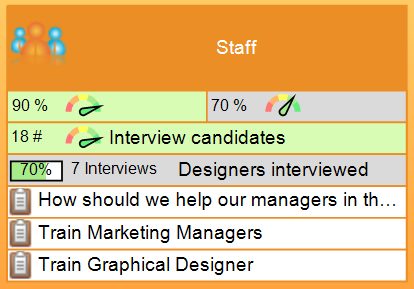 Do market research to find out who our users are and what information they are looking for. Use the Content Business System to create high-quality content to address the needs of potential clients. Use a Marketing Business System to promote created content for target user groups. We need to create high-quality content. The company from an example is not going to use any black-SEO methods. 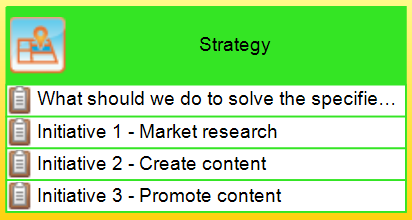 Following the 7-S model, I’m adding Use white-SEO methods only to the Shared Values. The creation of high-quality content and marketing of the new content will require certain skills. The “Skills” part of the 7-S framework suggests explicitly marking the skills needed. We need experts in our domain, those who have excellent research and writing skills. We need graphic designers, so we have a graphical design skill. We need someone with content promotion skills. In a real project, I would need to find some better KPIs for training, like we discussed, for example, in this article. You can see both metrics on the screenshot. What leadership style and cultural qualities will help us to achieve our objective? Invest in the training of the current manager? A company’s manager should decide what is more appropriate in this case. Also, we need to be able to communicate the principles of high-quality content creation and why we need it to all members of our team. What structure do we need to address the website traffic challenge? For example, the research and writing experts can be mentored by a senior editor. We might have some insights about the structure we need once all the business systems are formed. This 7-S template gives us a big picture of what can we do about website traffic challenge. 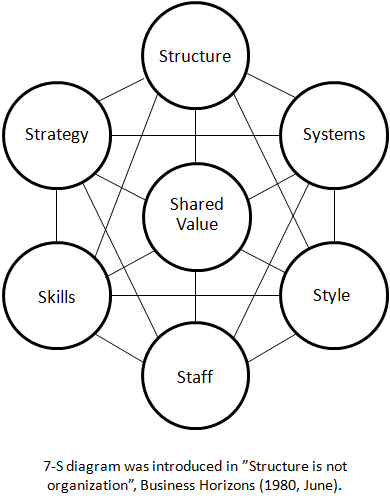 I’d call the 7-S framework a business compass. The compass alone won’t get you from point A to point B, but without it, you will fail to make the journey (execute the strategy properly). The 7-S model helps to focus on different aspects of the business, especially on the “soft” parts, such as Shared Values, Skills, Staff, Style. The 7-S framework suggests a connection between “soft” and “hard” Ss – having a problem with one S will block achieving results. All the Ss, especially “soft” ones, can be measured.